Co-organised by ika-RWTH and Bax & Company, the ALLIANCE Future Lightweighting Day took place at RWTH Aachen University on September 20th. The objective of the event was to bring together stakeholders from different parts of the automotive value chain, and initiate dialogue on the current status and future directions in the field of lightweighting. The day included presentations from the four winners of the ALLIANCE Lightweight Open Innovation Challenge (LOIC), who showcased their technologies to ALLIANCE OEMs and suppliers (Daimler, Opel, Toyota, CRF- the Research Centre of FCA, Thyssenkrupp, and Novelis), followed by a constructive round table discussion on the obstacles in the automotive lightweighting arena, and potential solutions. The day concluded with presentations on the latest research results from ALLIANCE. 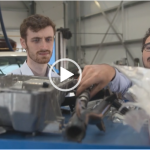 The event highlighted the impact of the Lightweight Open Innovation Challenge, which has successfully mobilised innovators from around the world to contribute with tangible ideas for affordable and financially viable lightweighting of mass produced cars. The four challenge winners hail from very different backgrounds; ranging from a low TRL (3-4) concept for a next generation press hardening process that saves energy and time, to a high TRL forged steel design component with optimised geometry, delivering great lightweighting, as well as lower costs per part. The finalists collectively leveraged a wide range of materials and offered a seamless combination of their material of choice with the respective manufacturing process, even including a solid solution library for multi-material joining technologies that enables the incorporation of proposed innovative components into a fully assembled car body – without the need to fully re-invent the established assembly lines that carmakers have invested in for decades. The success of the ALLIANCE Lightweight Open Innovation Challenge demonstrates that even without the promise of direct financial gain or prizes, Europe’s carmakers offer an attractive potential buyers panel to mobilise innovators to present their best ideas. From the carmakers’ side, the challenge demonstrated a new way of mapping the lightweighting innovation landscape, and discovering potential suppliers. 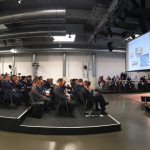 The round table discussion proved to be a valuable format for involving more stakeholders and sourcing more opinions and ideas on the future of European automotive lightweighting. The presentations of research results gave attendees key insights from the ALLIANCE project. Results from the developments of new aluminium grades were presented from Novelis, a multidisciplinary optimisation methodology from Opel, and a lifecycle cost and environmental assessment model by ika-RWTH. Additionally, results were presented on the optimisation of dynamic systems (using parametric order reduced models) by Fraunhofer LBF, the Extended Target Weighting Approach by IPEK-KIT, the influence of temperature on the mechanical behaviour of GFRP by inspire, and the comparison of the environmental performance between a reference ICE and electric vehicles, by University of Florence. ALLIANCE consortium members are today exploring how they can leverage the success of this Challenge into future Challenges that can help accelerate the adoption of innovation in car industry, as well as how they can continue the dialogue between stakeholders.